Need help to run LiveMIDI quickly? Check out FAQ or Getting Started guide! It may run with lower clock speeds with some tweaks, but will not be guaranteed to run smoothly especially on the lyrics view. Check out the FAQ section on some tweaks you can try on those devices. You can obtain both paid and DEMO versions from Google Play. Refer to installation method for the particular application stores. 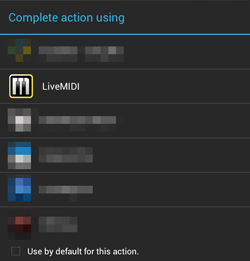 After successful installation of LiveMIDI, you should see the following icon in the application menu within the Android device. LiveMIDI supports playing music in MIDI format, with .MID, .MIDI, or .KAR extensions. It also supports ZIP archives containing the supported MIDI format files. You can copy files directly from your computer to your device using "USB Storage Mode" available on Android. Connect your device using the provided USB cable to your computer, and choose "USB Storage Mode" on your phone. You can then browse the device as a regular USB flash drive, and start copying your MIDI files or ZIP archives to the device. Some devices also offers copying files over Wi-Fi network. Please refer to your device's user manual for more information. Depending on availability of SD or microSD card in your device, your files will be copied to either /sdcard, /sdcard0, /emmc, /mnt/sdcard, /mnt/sdcard0, /mnt/emmc, or various folder paths depending on the device. You'll need to refer these folder later when adding songs to the playlist in LiveMIDI. You can also simply eject your SD or microSD card from your device, and connect it to the computer using adapters. On most devices, your files will later be accessible within the /emmc or /sdcard0 folder from the device. Transferring files from another device or computer from bluetooth is also possible. On most devices, the transferred files will be accessible within the /sdcard/bluetooth folder in the device. Playing MIDI files from any browser or file manager available in the device is also supported. Clicking on any downloadable .MID, .MIDI, .KAR files from a website will open an "Complete action with" menu from the device. Simply choose "LiveMIDI" to open LiveMIDI and add the file to the playlist. If you cannot see the "Open with" menu, then most probably another application has been associated as default handler for the MIDI files types. To let LiveMIDI handle the file types, the default application handler must be unset. To change the file associations, refer to this instruction. The file is also accessible for later use in certain folder depending on the browser. On most devices, it can be found in /sdcard/Downloads folder. Please refer to your browser's documentation for more information. Check the Working With Playlist section for the next steps running LiveMIDI.